Who knew that people in small-town Texas had such long memories? And of course Queenie wishes that her memory were a little spottier when feelings for her high school love, Everett Coburn, resurface. He broke her heart and made her leave town--can she risk her heart again? At least she has a new job. Sure, it's cooking last meals for death row inmates, but at least they don't complain! But when secrets from the past emerge, will Queenie be able to stick by her family, or will she leave home again A fun-filled, touching story of food, football, and fooling around. I was in the mood for a lighter book when I picked this up, and I was not disappointed. Yes, it is a fun and easier read, but it isn't just a fluffy beach book. At the center of this story is a character readers can relate to, even if they don't always like her. Yes, I wanted to shake Queenie Wake from time to time. However, usually this is due to bad writing or character construction. However, in this case, Palmer wants us to to want to shake her! At first, I was worried that this book would be full of cliches--and it was. Sort of. I mean, that was the point. When Queenie first arrives back in North Star, the town is populated by the cast of all the ABC Family network shows. But, those stereotypes slowly unravel, which is really the point of the book. And, as the secondary characters start to evolve, so does Queenie. Another thing I loved about this book was the town of North Star. Even with Queenie's negative view of things, I wanted to move there. And I wanted to eat barbecue--especially the "Number one"! The plot of the book was fairly predictable, but well executed. Even though Queenie was infuriating at times, I ended up rooting for her in the end. 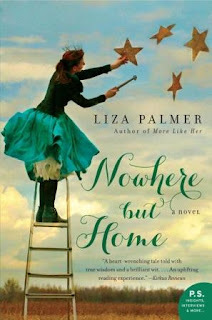 If you are looking for something fun to read that is a bit more substantial than you usual chick lit, pick up Nowhere but Home. This post is part of a blog tour by TLC Book Tours. I received a copy of the book to read and review. All opinions in this review are mine, and mine alone. I received no other compensation for this review. I love the play on stereotypes that you mention - what an unusual and fun idea! I'm so looking forward to reading this one.